The potato is almost synonymous with Ireland…think Ireland, think potato. And the Irish LOVE their potatoes! But potatoes are not native to Ireland, nor indeed to Europe. There is evidence that potatoes were being eaten in Peru at least 2500 years ago. The first potatoes were brought to Europe by the Spanish conquistadors in the 1500s and shortly after imported by the British to Ireland. They soon became a staple of the undernourished native Irish population as they were relatively easy to grow, required only a small amount of space (very important in an Ireland in which all property was owned by British or Irish Protestant landlords until 1793) and filling to the belly. Unfortunately, the potato crop was hit with a very contagious blight in the years 1845-47, resulting in the infamous Irish Potato Famine. Over 750,00 people died as a result of starvation and millions emigrated. (Over 1.5 million people emigrated to the United States alone in the years 1840-60.) The absolute shame of this Famine is that there were many other crops being grown by the peasants on landlords’ estates, all of it exported to Britain and Europe. Potatoes are grown in rows, called drills, and are lovely green fields covered in white or purple flowers. In Ireland, there are 2 crops of potatoes planted. The Spring crop is planted, depending upon the amount of frost in the ground, in February or March and harvested in late July or August. The Winter crop is then sown in August or September for a Christmas harvest. 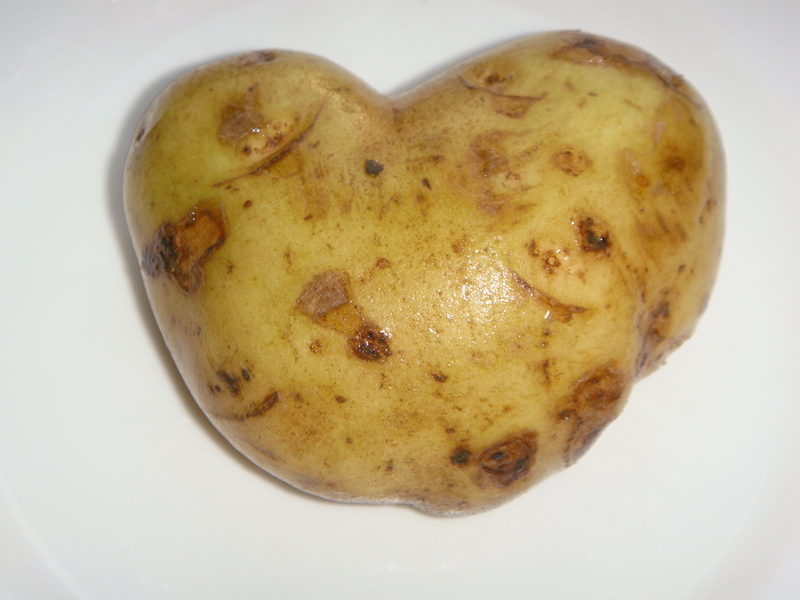 Of the 4000 varieties of potatoes grown world-wide, about 80 are grown in Ireland and Britain. Not here do you find Russets, Idahoes, Yukon Golds, Peruvian Blues, early Red or New potatoes. No, here in Ireland the most popular are Maris Pipers, Charlottes, Rockets, Roosters, Kerr’s Pinks, Golden Wonders, Home Guards, Caras and British Queens. No matter the variety, potatoes are often referred to by generic nicknames like praties, spuds, taters, murphies and taytos. Whatever the name, the very finest are described as “balls of flour”. I’ve been cooking potatoes since I was a child. In fact, one of my first culinary achievements was mashing boiled potatoes to a creamy smoothness. Of course, since then I’ve come through fried potatoes, double-stuffed baked potatoes, scalloped potatoes with and without cheese and/or onions, potatoes dauphinois, creamed potatoes, home fries, au gratin, en gallette, latkes, colcannon, champ and on and on and on. And never, with any problems, whether in the US, Spain or Ireland. Until a recent Wednesday. We had gone to buy fresh eggs from a local farmer and he convinced Mister to buy a bag of his freshly dug spuds. I duly prepared dinner and cooked the potatoes in my usual manner. Whipping them with the electric mixer, as usual, all was well until I added a couple of knobs of butter. ELMER’S GLUE! WALLPAPER PASTE! DISGUSTING!!!!! I couldn’t believe it, I’d never had this happen before. What kind of potatoes WERE these? “British Queens” was the answer. Of course, that explains it.